Business Improvement initiatives rely heavily on Action Plans to define important tasks for implementation. This charts the the way forward by crucially defining who does what, and by when. Failure to pay due care in compiling an Action Plan can seriously affect the quality of your efforts and output, denting any chances of your improvement idea ever taking off. 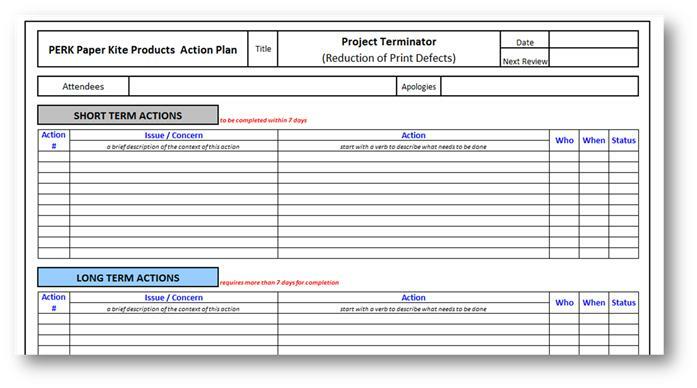 Done correctly however, Action Plans can be an effective weapon of mass improvements. How To Make Good Action Plans, Great. It’s a good idea to split your Action Plan into 2 sections, one for “Short Term” (to be done within the week in question) and another for “Long term” (more than a week required to complete the action). This will make it clear what needs to happen immediately. Actions should be documented and targeted at the intended audience as if they were not present when the action was assigned. This will ensure the correct context of the action is provided and help avoid the “What was this all about?” type of question further down the road. Endeavour to send out the Action Plan as soon as possible, preferably on the day the Actions are assigned. Start with the most important Actions, by using the pain vs. gain prioritisation technique. Actions with a higher business impact and requiring lesser effort being the highest ranked. Group related actions together and if necessary create categories to form clusters of related actionable efforts. If you do use a meeting room, consider using a whiteboard demarcated as your Action plan template. At the end of the meeting, simply take a digital photo of the completed whiteboard and email it to all assigned action owners. No double handling, no typing, no waste – typical Continuous Improvement! Assign a unique number for each Action. This will make it so much easier during discussions and meetings. If you refer to Action # 24, everyone immediately knows which one is referred to as opposed to explaining the action or reading it out – saves you a bit of time. How do you make your actions happen ? I’m a self-confessed coffee addict, technology geek and business improvement strategist. At the time of writing I am 42 years old. Even I’m astounded to realise 21 years, (or half of my life) has been spent working in the incredible world of Value Creation or more specifically Continuous Improvement, doing something I truly understand and enjoy. My career was built around 4 multinational companies involved in manufacturing and service related industries (Nestle, Unilever, Vodafone and Crown Cork). In conducting several high profile CI projects across 5 continents and 12 countries, I discovered there is one universal translation to Continuous Improvement and it’s called Value Creation.